Let me introduce you to Steven Icanberry! Several years ago my oldest daughter and her husband gave me a complete Polaroid 900 Camera system for fathers day. I like old cameras and this one sat in a glass display case in my studio for years. It was a beautiful camera but with film no longer being made it was living its life as a hanger queen only. One day while exploring one of the 4×5 Facebook groups I came across a post from Alpenhause Kamera Werke and Steven Icanberry, He was advertising a conversion on the older Polaroid Land Cameras like my 900 to 4×5 film with a film back and a coupled rangefinder calibrated to the new 4×5 lens he would install! Steven is a disabled veteran who makes his living from converting these cameras! This was simply too good to be true and after calling him and with his advice for options and lens selection I sent off my camera to him to be converted. Now, a little bit of info on his designs and options. His 4×5 film back is of his own design and is small and lighter than any other on the market. He has them made by a local machine shop and I can attest to the quality of it! He removes the old lens and makes a new lens plate mounting your choice of lenses. I choose a Fujicon 150mm lens. He couples the lens to the rangefinder system in the camera and calibrates it to be perfect. (This was the big draw for me as I was looking for a simple 4×5 carry around camera). He also cleaned all of the rangefinder optics assuring sharp clear viewing. I was offered a large selection of colors and new clothes for my camera, I choose bright blue and a silver top along with a built in shutter release cable. Look at the top image above and tell me that the camera doesn’t look stunning! His camera conversions are simply stunning in their beauty and functionality! For those of you who like and desire to shoot film I strongly suggest picking up one of his cameras. You will not be disappointed at all and you will be helping a disabled US Veteran make a living. But more importantly you will have a camera system that is as beautiful as it is functional. I am going to close this with a few images of some of Stevens cameras and the first shot I took with mine. He advertises starting pricing at around $500 for a converted camera in stock and also does custom conversions (like mine). I paid $900 for mine, but I chose a new custom lens and several other options! Am I satisfied? YOU BET!! Please consider having Steven Icanberry and Alpenhause Kamera Werke do a conversion or sell you a stock conversion! It is my wish to spread the camera goodness around and this is one good company! An Easy & Cost Effective Way To Fix Paper Issues! Van Dyke Brown emulsion is basically on the acidic side of things chemically and as a result of this I have been forced to wash most of my papers with a acid bath. This caused a increase in my process by 2 days. So I am testing Fumed Alumina which is acidic unlike Fumed Silica which is neutral. I decided to go with the Alumina test first and will do a followup post down the line with the Fumed Silica. Initial results were quite pleasing with both Revere Platinum and Lana Aquarelle papers. I got a MAJOR increase in Dmax with both the Lana and Revere papers, but upon completion of my final wash the Revere was VERY EASY to damage with finger smudges until it dried. The Revere had a tendency for the Alumina to easily rub off the Alumina while wet whereas the Lana was strongly attached. The Alumina did fix ALL of the spotting issues that I had when using the Revere Platinum paper but the fact that it will rub off when wet causes some concern but it is easily overcome with careful handling. Dry roll on the Fumed Alumina in 2 directions and rap the paper edge on the table to remove the excess. Make sure that you use a good mask to filter out this dust as it might irritate your lungs. DO NOT OVER COAT or you will get streaks when you coat the emulsion. The rolling step only takes about 30 seconds! You will need to put about 1 TSP of the Alumina into a small paint tray then pre load a small (3″) HARD foam roller with it. Coat as normal after you roll on the Alumina. You will need about 12 extra drops of VDB emulsion due to it absorbing more. My basic quantity of VDB emulsion for a 8×12 sheet of paper coated with Alumina is 48 Drops of emulsion and 2 drops of Tween 20 at 25% (you will need to dilute the Tween from 50%) solution. For this post I brushed on the emulsion. In the past I would normally use a glass rod for coating but the Alumina creates a very rough surface and I was afraid of damaging the paper. Dry and Expose. Here you will find that the addition of the Alumina will DECREASE your exposure about 1.5 stops! 1st water bath with distilled water and a pinch of citric acid, 2 min. This bath will remove any extra ferric ammonium citrate which will cause a yellow paper stain. This bath will darken the print. Do not worry as the FIX will balance contrasts and bring out the highlights! Fresh water bath to remove citric acid. 2 min. If you are Gold Toning, this step is VERY important as any Citric Acid will destroy the toner bath! Gold toning bath 2 to 5 min to taste. 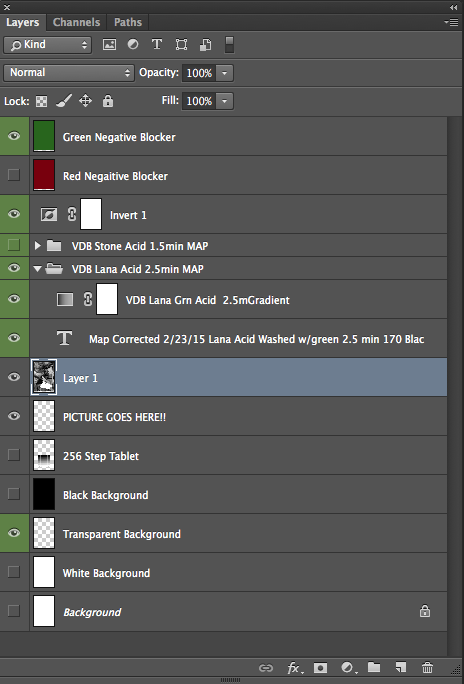 The toning process requires CONSTANT AGITATION! After 2 or 3 prints toned add 5ml/print of Gold Chloride to bring the bath back up to strength. This toning bath will further darken the print. Do not worry as the FIX will balance contrasts and bring out the highlights! Fix for 2 min with Sodium Thiosulfate for 2 min. 30g/L. I do not believe that any further time will help the process. Final moving fresh water bath for 30 min. 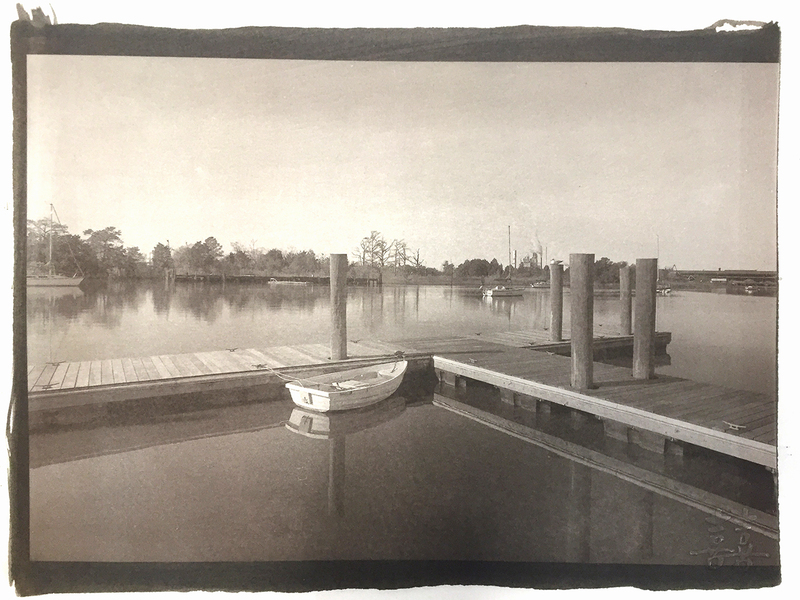 Air dry, I spread out old towels on a table top and place the print on it for about 10 min to absorb most of the water thru the back of the print. I will then hang the prints to dry by a corner. Use a heat press to flatten your prints at 170deg for 20 seconds. The heat press step is to make the paper flat again. Hand rub in SOFT custom wax coating for protection then heat to force the wax to be absorbed into the paper fiber with a hair drier (more about this in a future post). All in all this was a VERY easy fix to the acid washing step and only added about 30 seconds to roll on the Alumina. The Fumed Alumina can be purchased at Bostick & Sullivan for $15/500g which will do about 100 sheets of 8×12 paper. The increase in Dmax with the Fumed Alumina is amazing and the resulting images are stunning. Please let me know what you think of this post and with suggestions for future posts! Who knew Gold would be so cool? A small quantity of fumed Alumina is rolled on to a piece of paper with a dry high density foam paint roller. It spreads evenly on to the paper leaving a velvety surface to the touch. 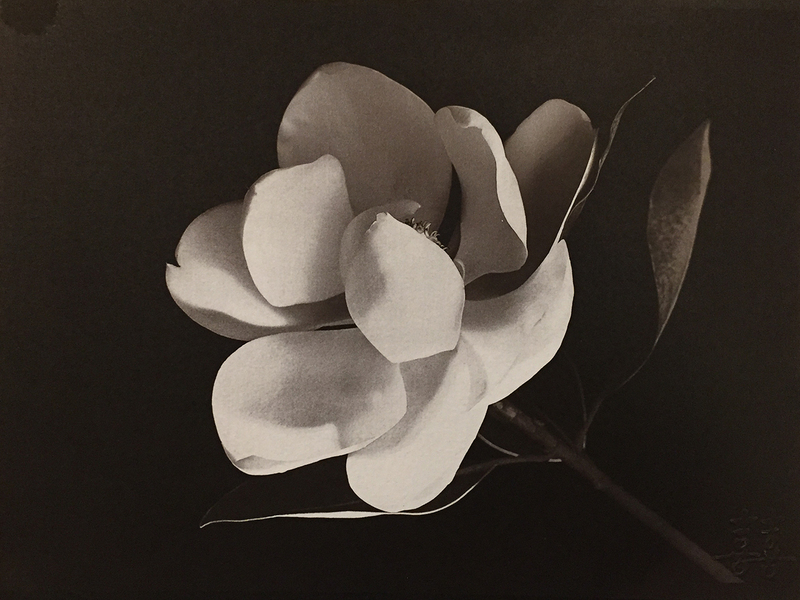 The paper can then be coated with a platinum/palladium solution, dried, exposed and developed in the standard method. 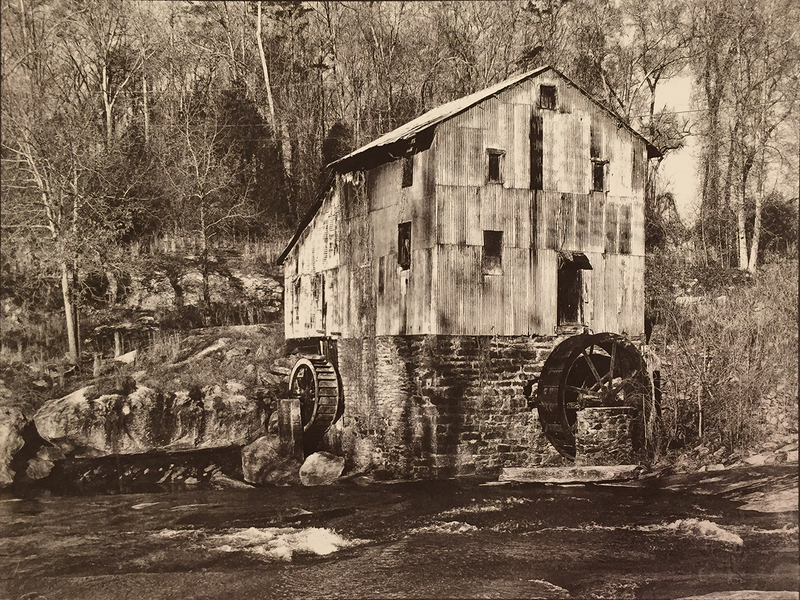 It is suspected that the Alumina can be used for other hand coated photographic processes like cyanotype, van dyke, Kallitype, and similar processes. It has already been tested with great success with albumen prints. The coating acts as a sizing enhancer and appears to protect the emulsion from alkali buffers. 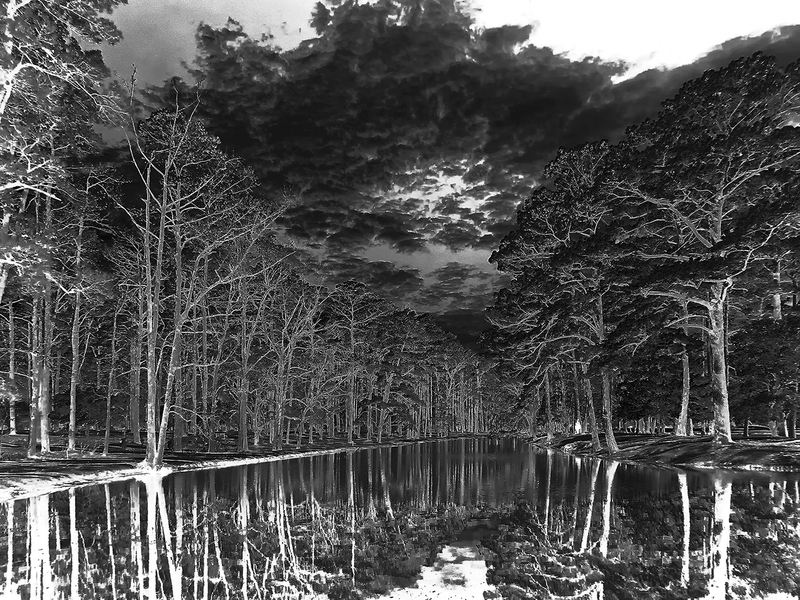 Contrast increases but appears largely to be due to enhancement of the blacks. So, this then is the great experiment of March! I will report back on the measured effect as it applies to my process in the next post! 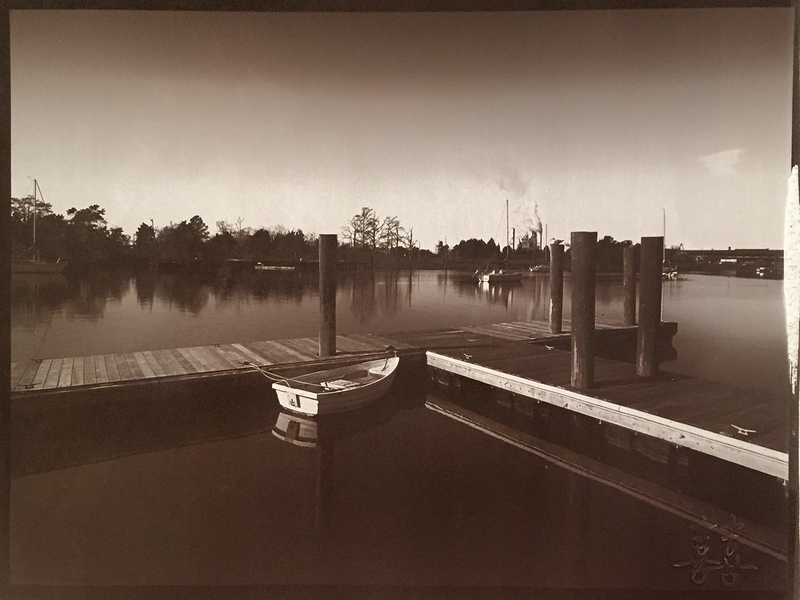 Now, onto the reason for this posting, Gold Toning of Van Dyke Brown prints! 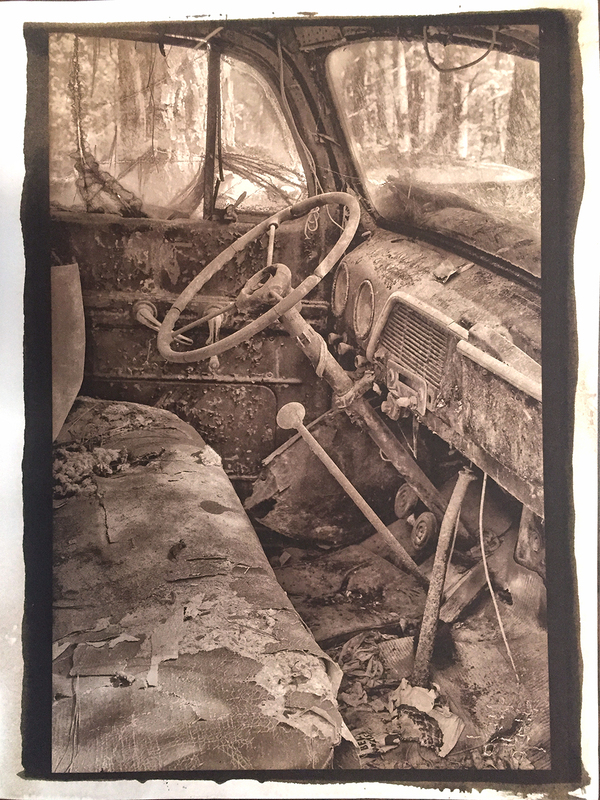 Now that I am getting consistent prints from my acid washed Lana Aquarelle 140lb HP and Stonehenge papers I wanted to explore increasing the Dmax further by Gold toning. Rather than mixing my own gold toning solution (basically I am very lazy) I decided to purchase Bostick & Sullivans Gold Toning liquid solution. This is simply 2 bottles of a chemicals, solution A is 2% Ammonium Thiocyanate and solution B is .2% Gold Chloride. You mix 50ml each of A and B with enough distilled water to make 500ml of working gold toner. Easy peasy, no powders to measure and mix. B&S says that you can replenish the solution by adding 5ml of the Gold Chloride for each 8×10 print you tone. I do this in the toning bath but when finished I am thinking that I need to throw it away and treat it more like a 1 shot toner. Since the cost of the Gold Toning kit is so reasonable from B&S ($45) and will make such a large amount of working toning bath 10 bottles of 500ml working bath I am inclined to do so. 1st water bath with 2000ml of distilled water and 1 tsp of Citric Acid for 2 min to remove excess sensitizer (yellow Stain) from the paper and to help prevent emulsion wash off. Gold toning bath, watching for toning in the mid tones and highlights to indicate finish. 2nd water bath with 2000ml of distilled water and 1tsp of Citric Acid. Rinse in tap water for 30 min. 1b. Plain tap water bath for 1 min to remove Citric Acid. Since the Citric Acid will destroy the gold toner and that there is very little chance for me to remove most of it prior to toning then there is the very likely chance that it will be ruined even with a plain water bath prior to toning! The acid problem with the gold toner is the only real issue to its use. I really do not want to have to put the print into my print washer for 5 min to clear all of the acid so a 1 shot toning bath for about 3 images seem a good trade off to me. Time will tell! I hope that you have been paying attention to the images spaced through out the post. All of them have gone thru the gold going process and with the exception to the last one I did not add any more Good Chloride to the bath. Because of this you can notice that with the exception of the 1st and last print each print after the 1st look more brown as we progress down the line! With the last one I added 25ml of the gold to bring the bath back up to strength and you can see the difference. You can tell that it is run down by how long it takes for the toning process to complete to the point where you like the results. 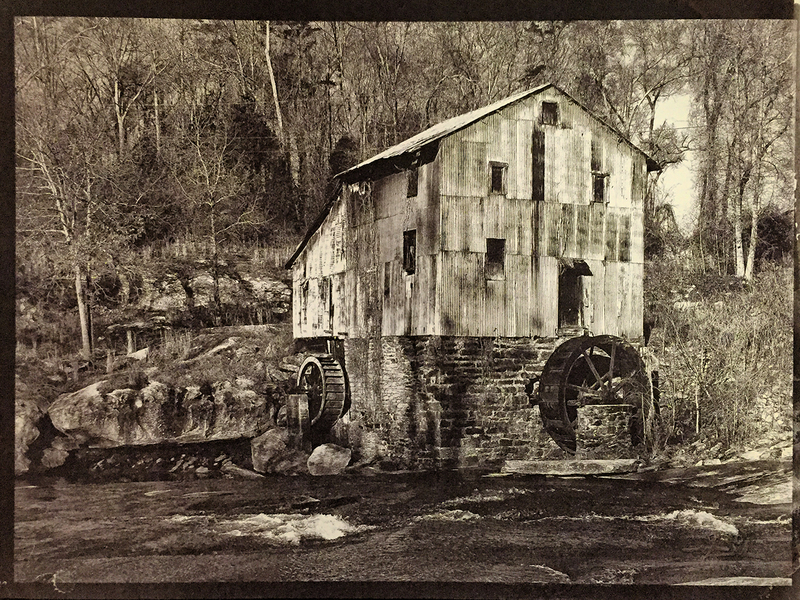 I have been told by friends online that I could have taken the toning process a bit further. The thing about gold toning is that the gold replaces all of the silver in the print which shifts the print colors from dark brown to a very platinum looking black. You can even get a bluish tint in the dark tones of your print! 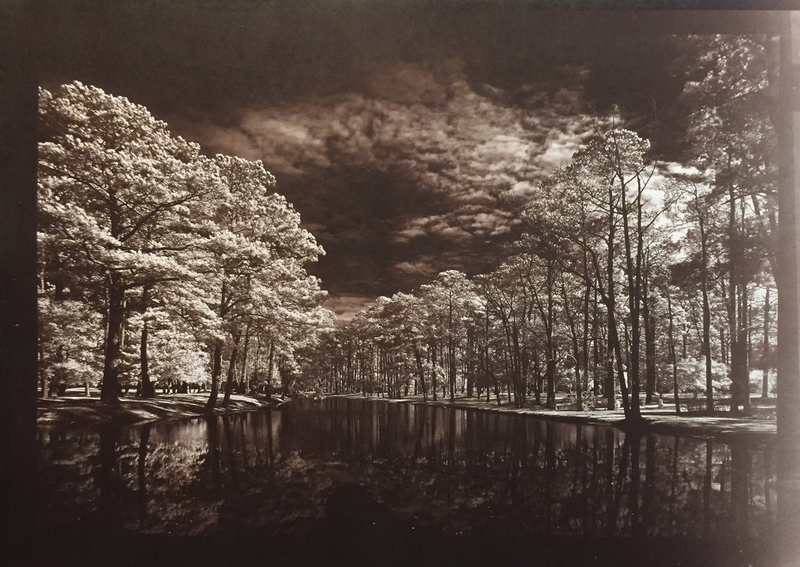 I think that the toning process is VERY worth while and highly recommend that you give it a try. The next post should be on using the Fumed Alumina as an agent to overcome a non-acidic paper coating as well as increasing the prints Dmax! 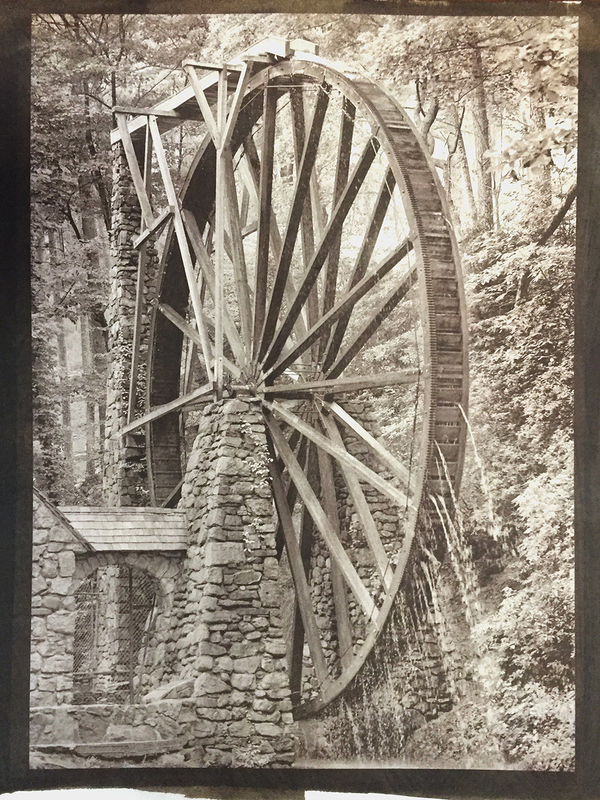 In my recent printing of the 1840 Van Dyke Brown prints, I have experienced a lot of dark spots on my prints. 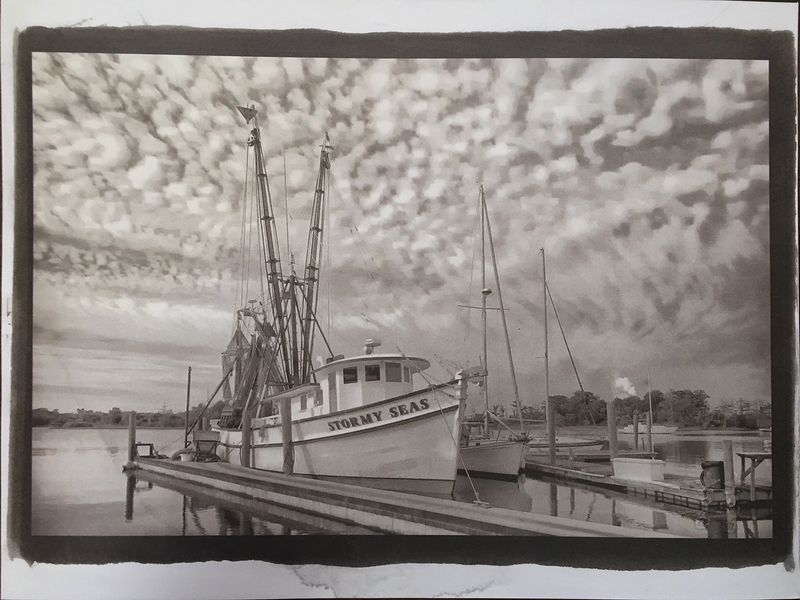 I ordered several types of papers to try to see if it was a paper problem… I have been using Revere Platinum paper which is easy to coat (provided you use Tween 20 in the emulsion) and gives great tonality but seems to ALWAYS have dark spots all through the print! Look closely at the image to the right. You will notice dark spots (look above the light) that go completely through the paper! This has been driving me nuts and nothing that I did to try and fix the issue ever helped. Cot 320 (on hand) This paper is a little better than the Arches paper in that it holds the emulsion a little better but is still washes off the surface in the 1st water bath! It is usable for Van Dyke Brown printing though… It has been recently suggested to me that I soak this paper in a 10% citric acid bath, wash it and dry it in order to get better surface adhesion and a higher Dmax. I will try this in a week or two. Heavy Kozo 90 gsm (on hand) Bostick & Sullivan states that this paper will work great with Van Dyke Brown. The paper is made from 50% kozo and 50% abaca. Kozo is the inner bark of mulberry tree seedlings, producing a naturally white paper fiber which is very strong and long lasting. The paper looks very promising and fun to work with especially the ultra thin version that I chose to NOT work with due to it being extremely thin and the requirement of special tools to handle it. I have seen videos of artists using it which is why I decided to purchase a few sheets to experiment with. But I have not had time to work with it yet. So look for a post specific to this wonderous paper in the future! Revere Platinum (on hand). 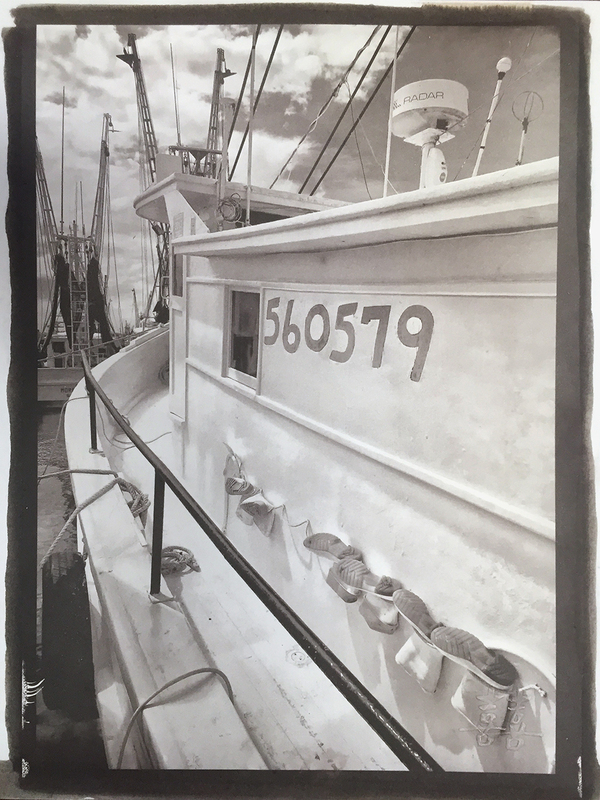 This paper coats wonderfully with the addition of Tween and the emulsion does NOT wash off in the first water bath! It gives wonderful deep tones and color. The only (MAJOR ISSUE) problem with it is that it gets white and brown spots all over the paper that goes completely through the paper from front to back. These spots can totally ruin the print… I have tried everything that I can think of to fix this issue as I really like the paper but I am at a total loss. Rising Stonehenge (new) This paper coats great with Tween and does not wash off. There are no spots and the adjustment curve matches the one for Revere! It is a thinner paper and seems easy to damage during coating. It takes less emulsion to coat the same size as the other papers. I did find that the emulsion migrates from the coated areas to the white around the edges. I have no idea as to why but I think that if I lower the number of drops that I use for coating that it might take care of the problem. 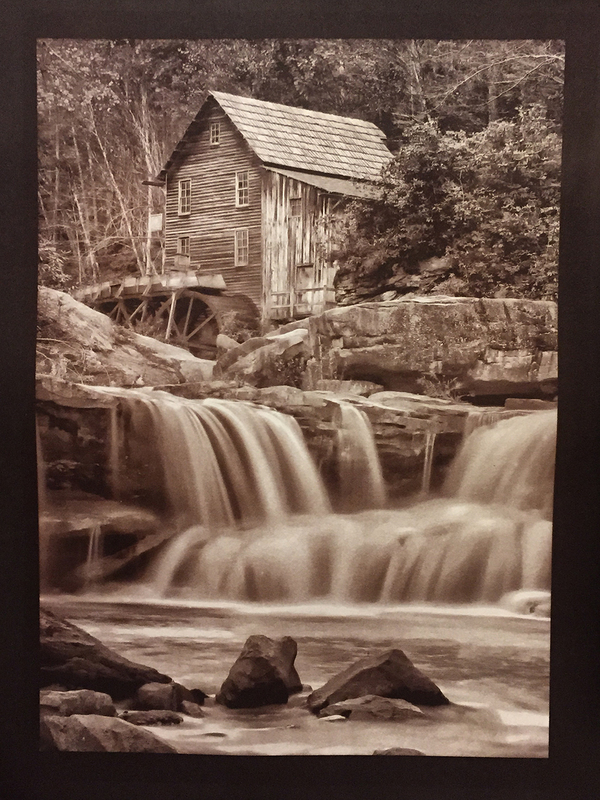 It generates a fantastic deep brown warm tone across the image and I love the final prints on it. This paper is readily available on Amazon as well as many other locations. Lana Aquarelle (new) All that I can say about this paper is WOW! It coats and prints the Van Dyke Brown images with amazing density and tone. It coats easily with Tween and is a heavy paper with not spotting or migration issues. This is going to be my main paper as long as I can get it. So far the only place that I have found it is at Bostic & Sullivan. The curves for the Revere paper work perfectly with the Lana! Using a glass coating rod for a 8×12 print it takes 36 drops of VDB and 2 drops of Tween 25%. Using a Synthetic Sable brush it takes 72 doors of VDB and 2 drops of Tween 25%. Once coated, I let it AIR DRY for 30 min then expose in a 12 bulb UV box in a vacuum frame for 2 to 4 min depending on the paper and negative. Usually the base exposure time is 3 min. As I said the results from this paper is a nice warm print with great density in the black areas and the edges. I coated four pieces of paper yesterday, two with a glass coating rod and two with a synthetic Sable brush. Both methods worked very well and gave nice even coatings. The image above was a applied with the Sable brush and the one below was coated with a glass rod. Notice in the image above if the lone dinghy that there are NO spots at all. The paper was clean on the front and back and gave a nice density in the dark areas! This paper is very heavy and after coating it will want to curl a little but will flatten in about 5 min. Let it dry for the full 30 min in the air and do not use a hair drier. 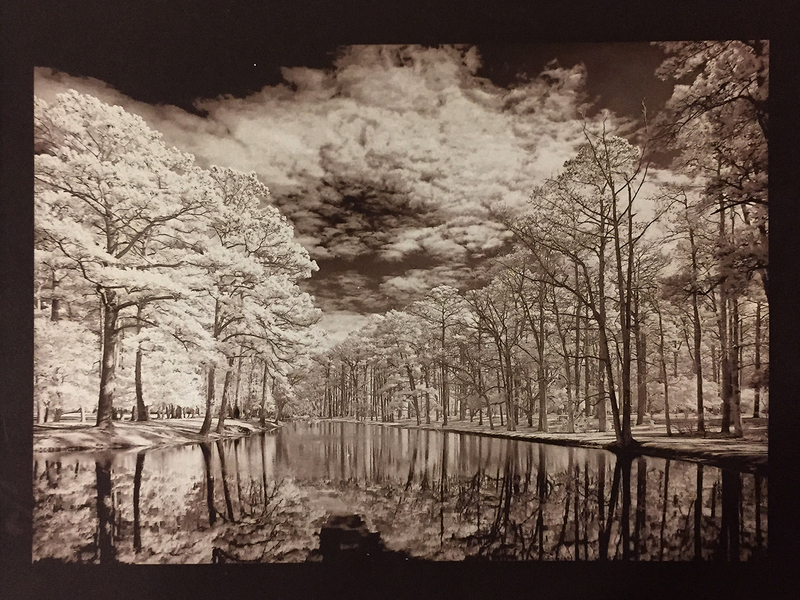 Using a glass coating rod for a 8×12 print it takes 26 drops of VDB and 2 drops of Tween 25%. Using a Synthetic Sable brush it takes 65 doors of VDB and 2 drops of Tween 25%. So far, my work with Rising Stonehenge has been very good. It coats evenly and the emulsion soaks into the paper fibers nicely. The print is very dense and nice dark areas. The paper is quite thin and I discovered that the surface is easily damaged during coating. Since the surface requires much less VDB emulsion I will reduce it the next time I coat (I used 36 drops of VDB and 2 drops of Tween for this test coating) and the surface damage will likely go away due to the glass rod not going across the paper surface more than 4 times ( for 36 drops the coating rod required 8 trips across the paper surface) thus reducing working the papers surface too much and causing damage. 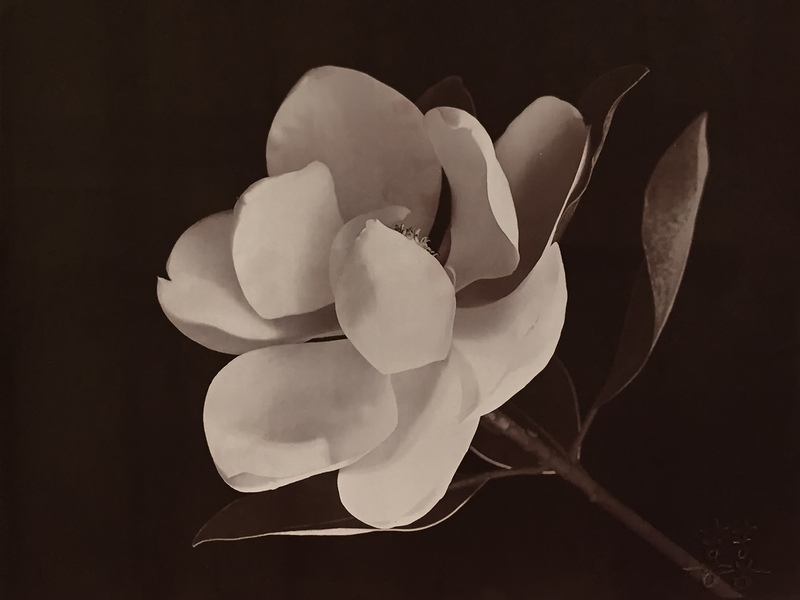 One small problem with the paper that I discovered was that the emulsion has a tendency to migrate from the coated areas to the uncoated areas giving a grey shadow around the image. If you look closely you can see actual small spots of it surrounding the coating. This is really no big deal but I am unsure as to why this is happening. I will continue to use this paper because it generates VERY WARM BROWN in the print and I just love the look of it! Now, it has been suggested that I soak or pre coat the paper with an acid bath of 10% citric acid for a 1 or 2 min, then wash the paper and allow it to dry before coating. I am told that this will vastly increase the papers Dmax! I am going to test this next time I print! The image at the top of this post was also printed on Rising Stonehenge paper! The Cot 320 paper is a very nice, smooth paper. I love the look and feel of it. BUT, for Van Dyke Brown it has a problem in that it will not readily absorb the VDB emulsion into the paper fibers. Even with Tween added to the emulsion, it is not enough. What happens is that in the first water bath after exposure the majority of the emulsion washes off in thick tendrils of brown goo. Unlike the Arches paper, enough is left on the paper to still make for a good (not great) image. There is enough promise from this paper that I am going to experiment further with this paper by washing the paper with an acidic solution of citric acid and distilled water, brushing it on and letting it soak in for a few seconds then washing the paper again with distilled water. Once it dries and I will flatten it in a low temp heat press and coat the VDB on it. I think that this will break down the surface coatings enough for it to accept the emulsion better and increase the papers Dmax. I will report on this more in the future. OK that is all for this post. I am not going to report on the Arches and Revere papers as I have discussed them in the previous two posts. A new (read OLD) way of printing! 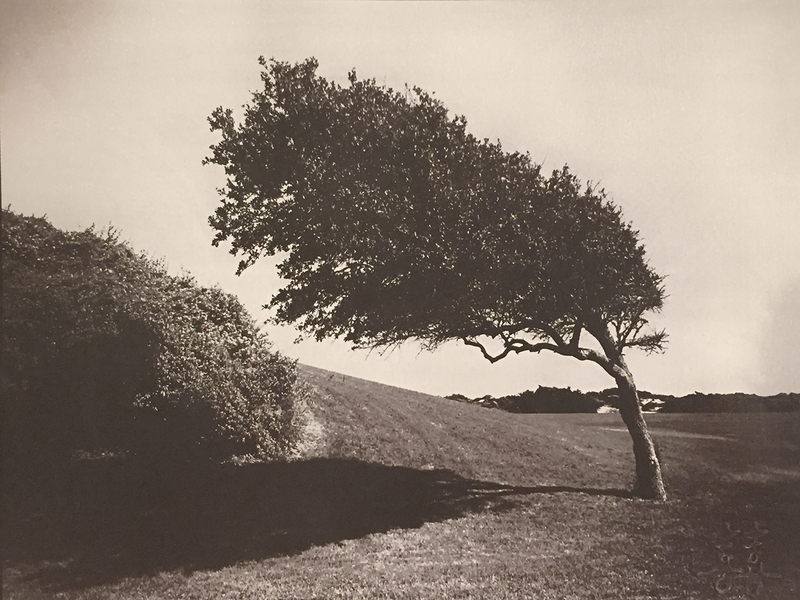 Van Dyke Brown is an early photographic printing process. The process was so named due to the similarity of the print color to that of a brown oil paint named for Flemish painter Anthony van Dyck. The Vandyke brown print is based on the first iron-silver process, the argentotype, invented in 1842 by the English astronomer, Sir John Herschel. Both processes utilize the action of light on ferric salts and their chemistry is very similar. The Vandyke process gets its name from its similarity in color to the deep brown pigment used by the Flemish painter Van Dyck. 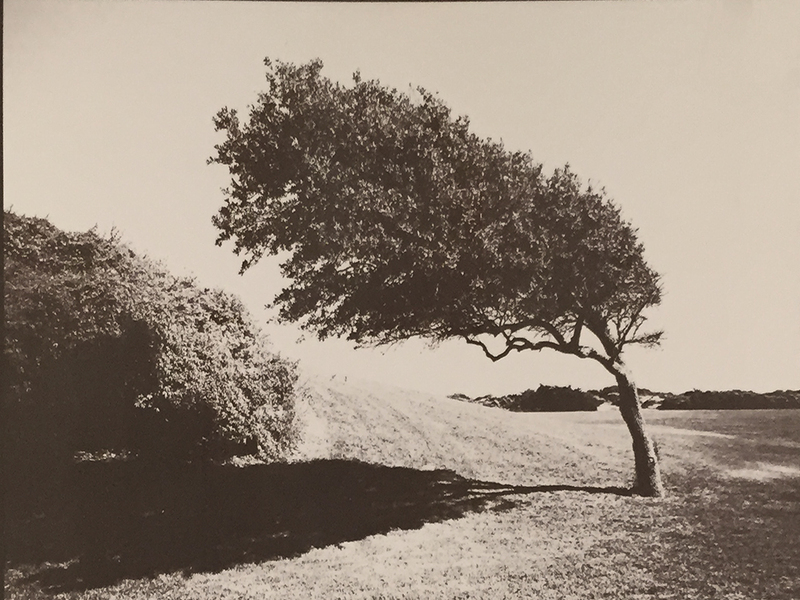 Vandyke brown prints are very simple and economical to make, with the sensitizer consisting of three readily available chemicals. Clearing is carried out in water and fixing is done in a weak solution of hypo. As you can see, this is a very early way of printing developed a long time before our current Silver Salt paper process. 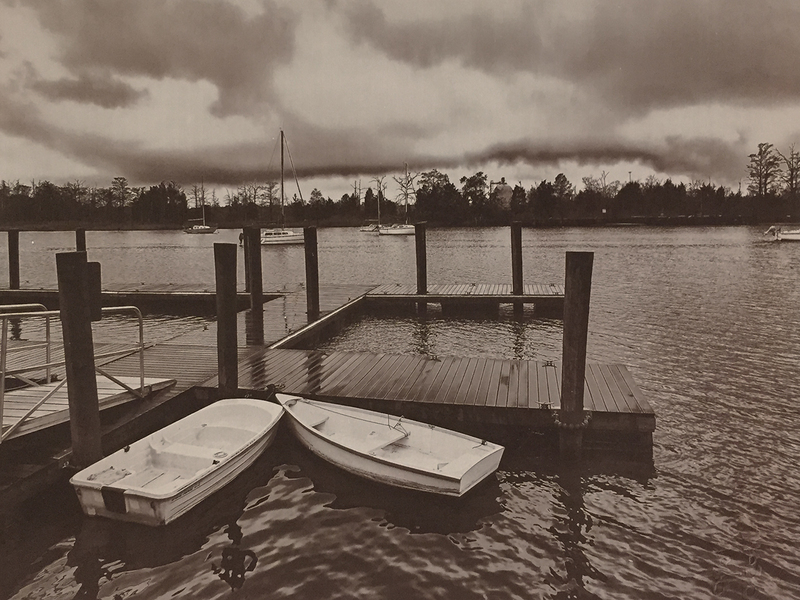 The images are a deep brown instead of the normal black and white that we are used to seeing. 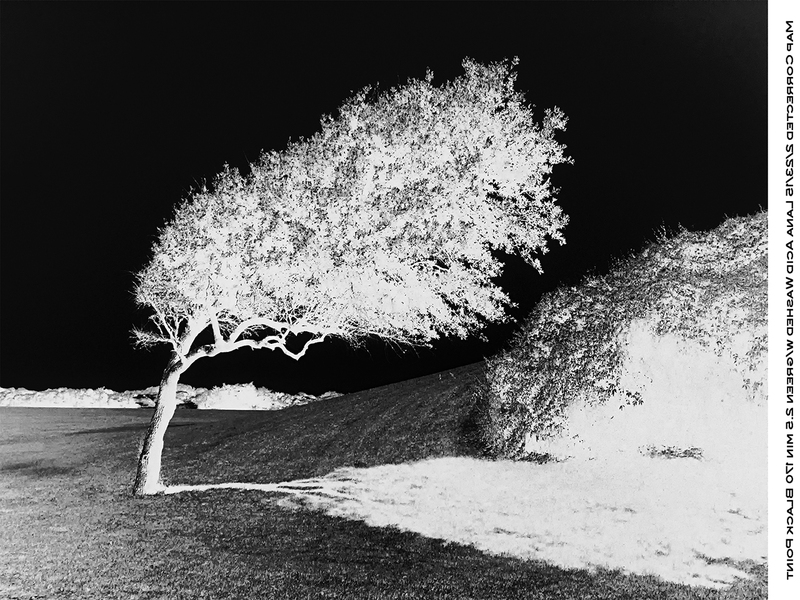 They are somewhat easy to create provided that you have done your homework and created the proper calibration images to create a calibration Gradient Map or Curve to apply to your negatives which adjust them for loss of mid tones in the printing process. 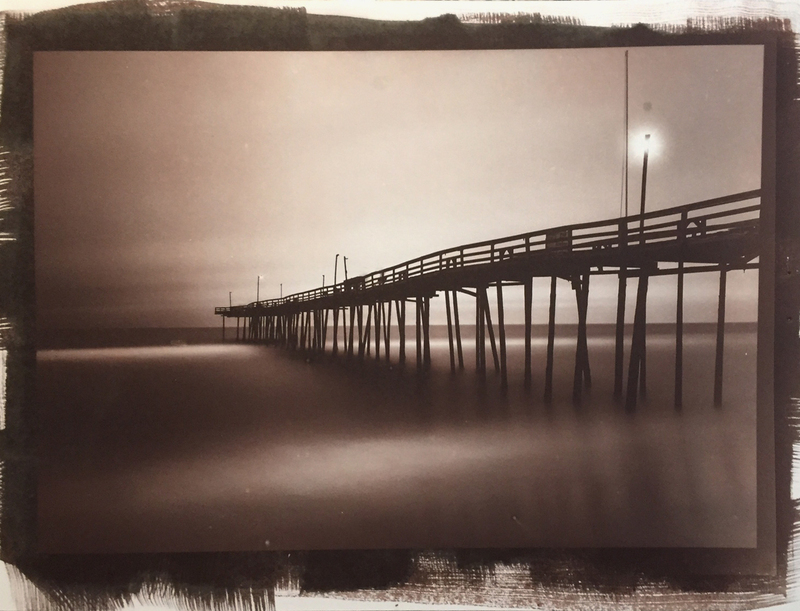 This is strictly a CONTACT PRINTING technique that requires a true negative that is placed on top of paper that YOU as the artist coat yourself with the Van Dyke Brown emulsion that you mix from simple chemistry! 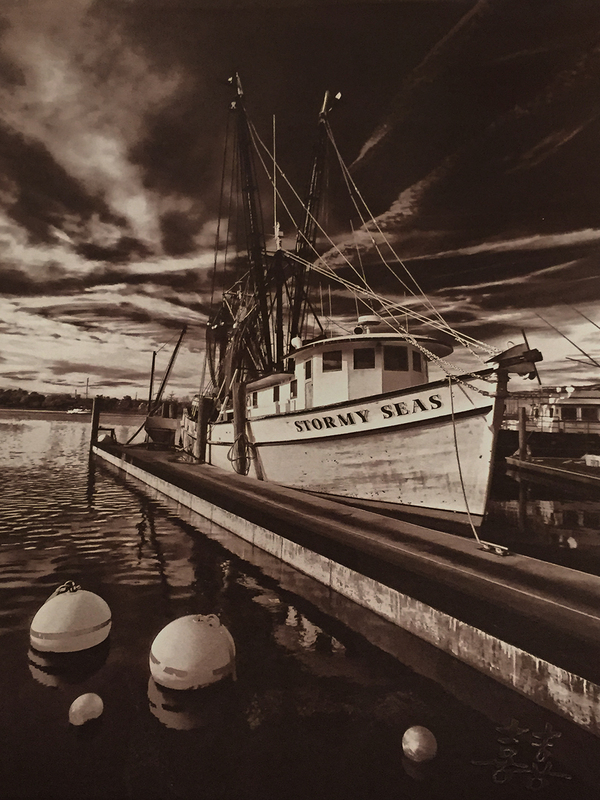 The coating process is done with a special brush that requires a very light touch or a glass coating rod that you use to push a line of liquid emulsion across the paper. 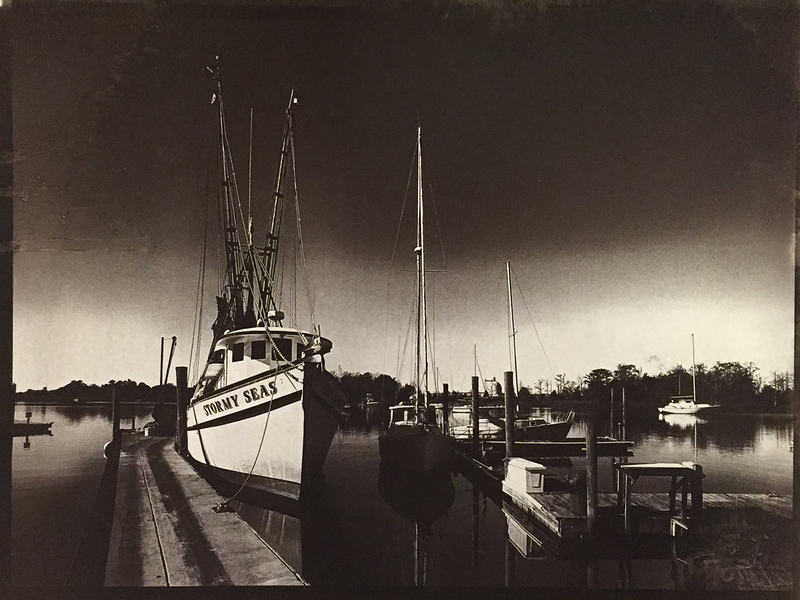 B&W Negative for Van Dyke Brown Print exposure calculated for 3 Min with the calibration applied. The liquid emulsion is measured by the number of drops from a glass eye dropper into a small glass then with a drop of two of a wetting agent like Tween 20 to help the coating process. 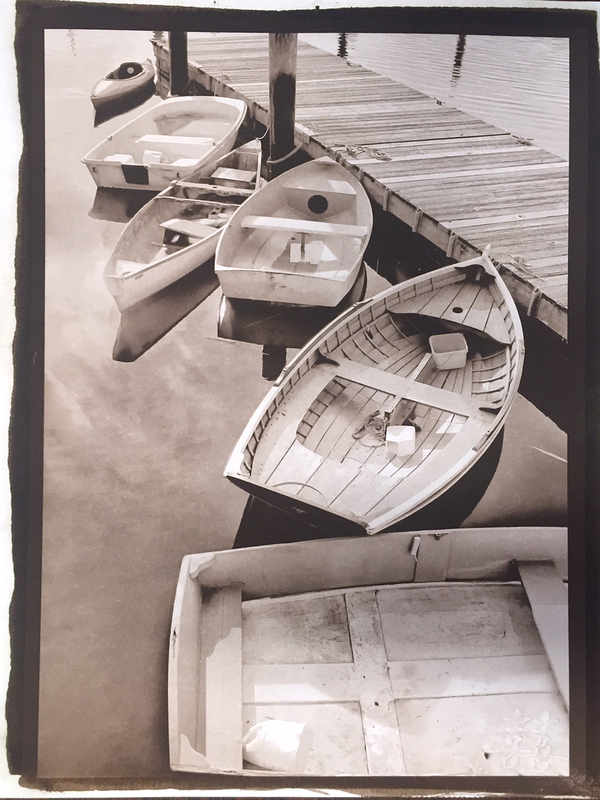 The paper/emulsion is allowed to dry then the negative which was created using my Epson 7900 printing on transparency material is placed on top of the coated paper. This sandwich is then placed in a printing box filled with 12 Fluorescent Black Light tubes which then expose the paper with UV light. 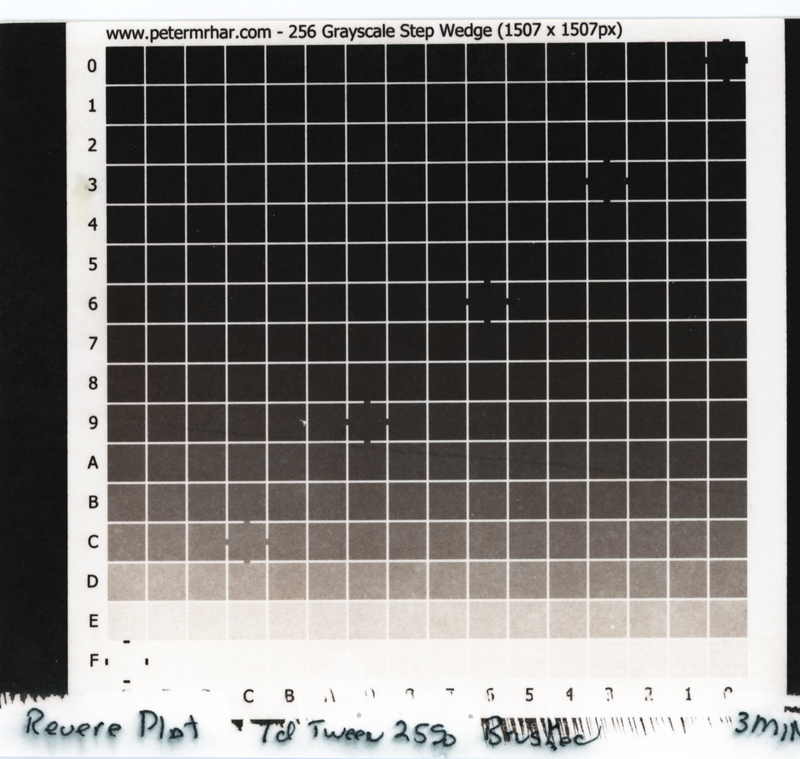 The exposure for the current paper I am using (Revere Platinum) has been calibrated to 3 or 4 min based upon the test chart above. 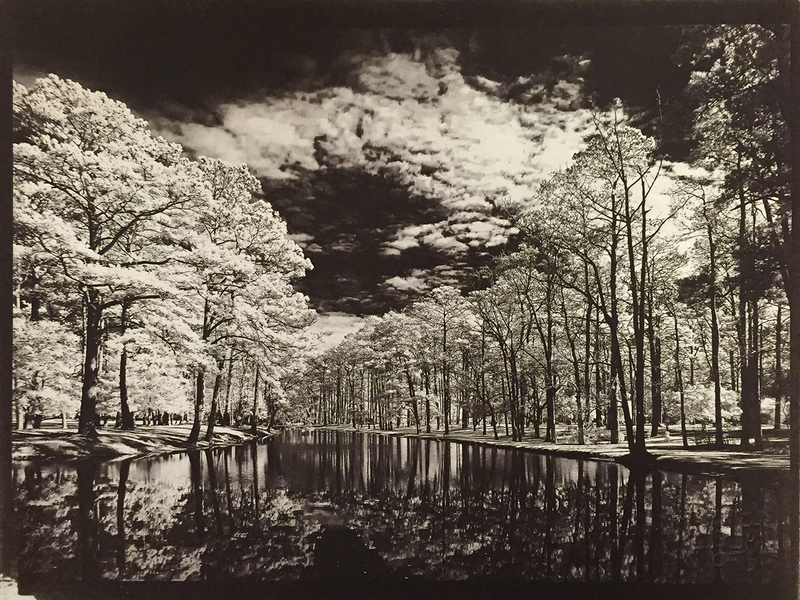 Van Dyke Brown Print, Over Exposed by 1.5 stops. This process is a POP process in which the image after being exposed can be seen on the paper once removed from the UV box. It is orange and yellow in color. It is placed in 2 consecutive distilled water baths that remove the yellow and darken the orange. Then it is placed in the fixer solution (Sodium thiosulfate) for 2 min. When the image is placed in the fix, it IMMEDIATELY changes from orange to a very dark brown and white picture. Finally the print is placed in a live water wash for 30 min then dried! This is a simple process that creates beautiful images that will leave you breathless as you view them! I am going to further develop and learn the process over the next month or two before I start on mastering the Platinum/Palladium printing process as well! Look forward to many more posts on the processes as I master them!